If you’re verklempt about Derek Jeter’s last day as a Yankee, I’ve got something to help cheer you up. Besides being home to one of baseball’s most legendary teams, New York is also where you’ll find the Finger Lakes AVA (American Viticultural Area), billed as “North America’s premier cool-climate wine growing region” by the Finger Lakes Wine Alliance. Even better, I’m about to introduce you to four rockin’ Rieslings from the Finger Lakes region. ‘Scuse the short notice, but in about 50 minutes, there’s a Twitter party to launch the 2013 vintage, with the hashtag #FLXRiesling. Can’t make it? No worries–you can read up on four of the wines here, and if you like what you see, you can always enjoy them after the fiesta. Before we go on, here’s El Full Disclosure: I received these four bottles as samples from the fine folks at the Finger Lakes Wine Alliance. I was not paid to write this post, and the opinions expressed below are my own. So with that said, here’s the scoop on the Finger Lakes, or FLX. For you science geeks, the Finger Lakes were carved out by glaciers over hundreds of thousands of years. This not only affects the soil where the grapes are grown, but the large bodies of water help moderate temperature year round, protecting the grapes from extremes. Riesling grapes are grown on 848 acres, and 220,000 cases of Riesling are produced annually. Each of the 115-plus wineries produces two to three styles of Riesling. Next week, I’ll provide more details about Riesling in “Mucho Gusto: Get to Know Riesling,” so stay tuned. 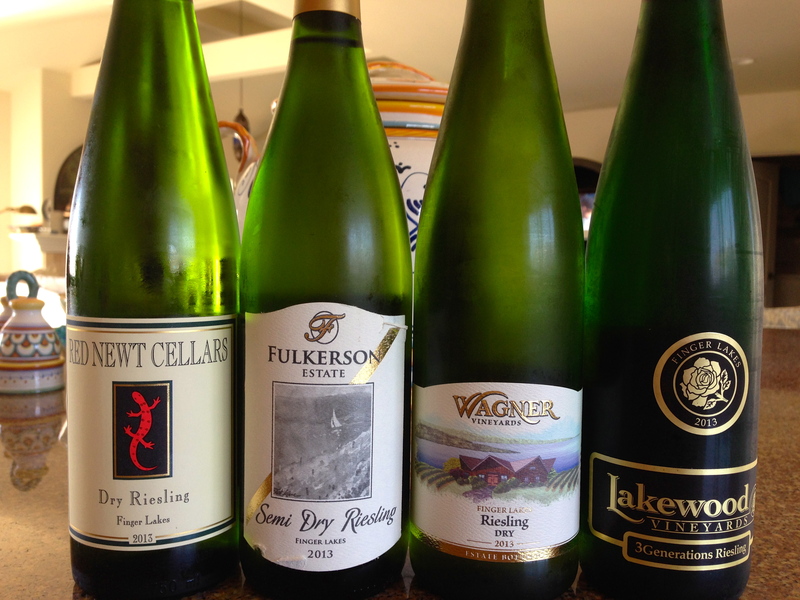 In the meantime, you can get acquainted (in alphabetical order) with each of the four Finger Lakes Rieslings I tried. Fulkerson Winery owner Sayre Fulkerson is a descendant of Caleb Fulkerson, a Revolutionary War veteran who established a farm on the west side of Seneca Lake in 1805. Grapes were first grown on the property in the 1830s, and winemaking operations formally began in 1989. 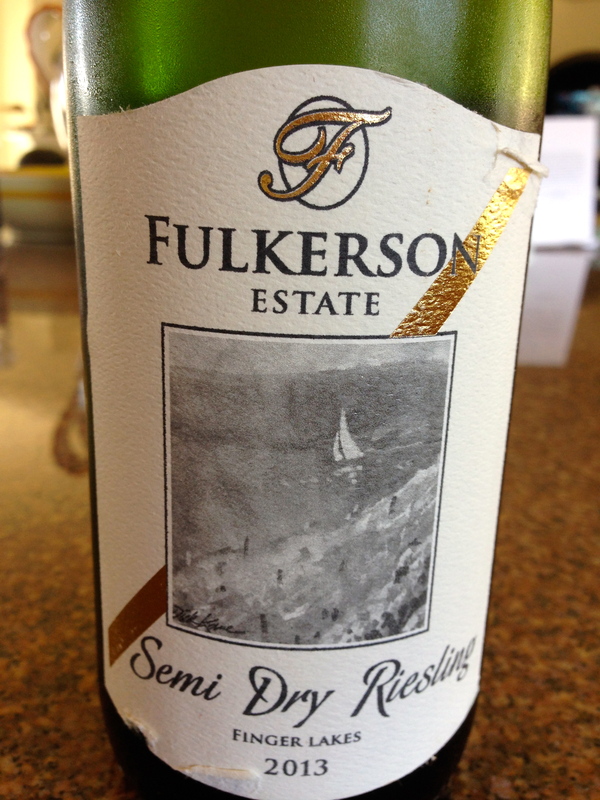 The 2013 Fulkerson Estate Semi-dry Riesling displays peach and floral notes with crisp acidity and a distinct minerality. The alcohol by volume is 12 percent. Learn more at http://www.fulkersonwinery.com. Lakewood Farm was a derelict peach and apple orchard on the west side of Seneca Lake when former dentist Frank Stamp purchased the property in 1951. He started planting grapes the next spring, and in 1989 the Stamp family opened the Lakewood Vineyards winery. With crisp minerality, a mild sweetness and delicate floral aromas, this classic Riesling has 11.6 percent alcohol by volume and retails for $19.99. 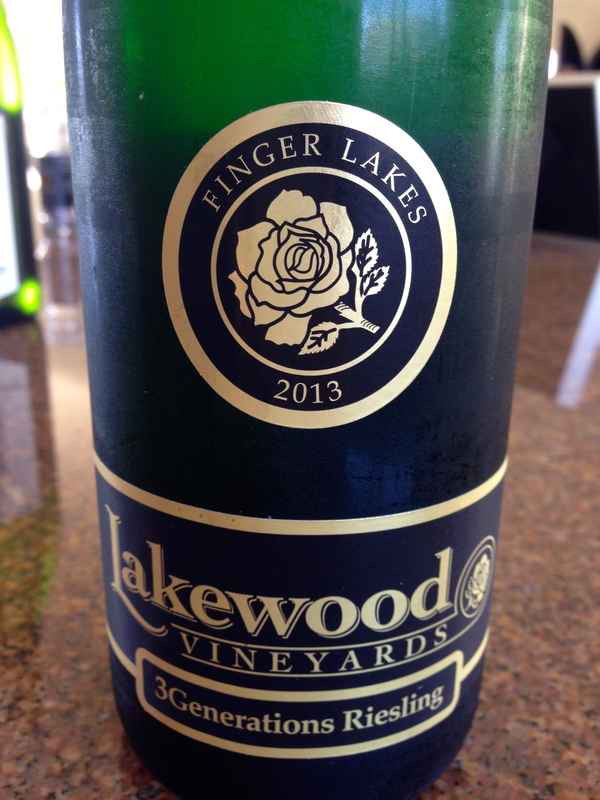 For more details, visit http://www.lakewoodvineyards.com. 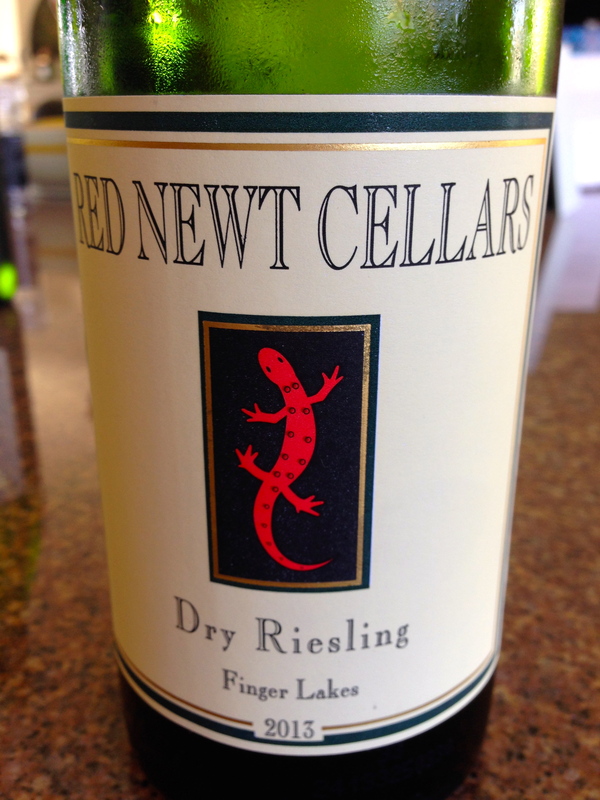 Red Newt Cellars is located on the east side of Seneca Lake in the town of Hector. The property is home to the winery and a bistro. 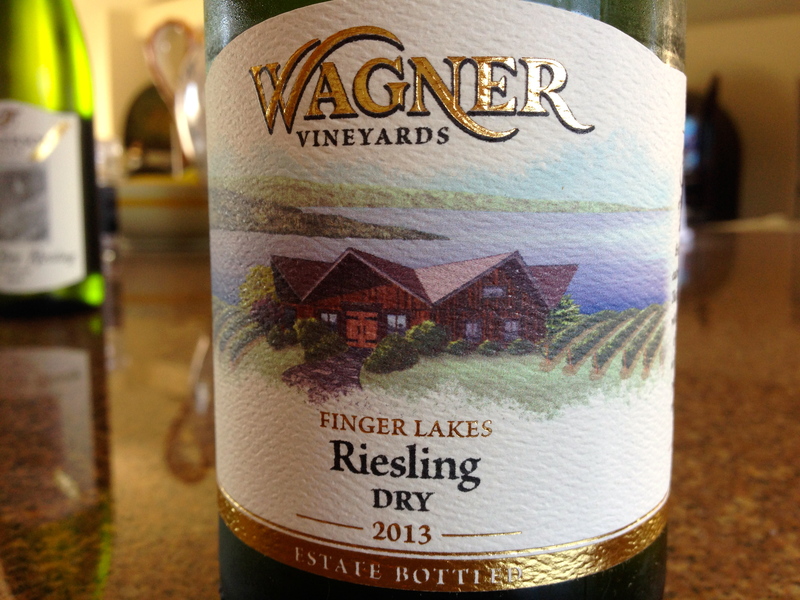 Founded in 1998, the winery produces mostly Rieslings, and the 2013 delivers aromas of pineapple and grapefruit, with apricot and lemon on the palate. Dry with a refreshing acidity, the wine has 11.7 percent alcohol by volume. If you pay attention to ratings, the 2012 vintage scored 89 points in Wine Spectator. 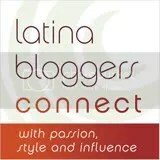 Visit http://www.rednewt.com for deets. Now go get your Riesling on, chicas y chicos. And see you next week with a more in-depth exploration of Riesling. ¡Salud!